Traditional Birth Attendants (TBAs), also known as traditional midwives or lay midwives provide care during pregnancy and childbirth without any formal education or training. They often learn their trade through apprenticeship or are self-taught. Uganda is predominantly rural, with only 13% of the population living in urban areas. There are only 1.4 midwives, nurses and doctors per 1,000 population (source: UNFPA). Due to limited access to health care, only 42% of births in Uganda are attended by skilled health personnel. TBAs are a controversial topic in global health. They are easily accessible, popular, and affordable for women who are unable or unwilling to use conventional medical care. On the other hand, they are often untrained and may do more harm than good to pregnant women and babies. There are different ways to approach this issue. You can educate the TBAs to improve their skills, you can forbid them from practicing, or you can try to change their role; have the TBAs counsel pregnant women and encourage them to go to a health center for care but not provide care themselves. Shifting their area of practice seems to be the most common choice in low resource areas such as rural Uganda. It capitalizes on the trust that women have with the TBAs in their community so that women get skilled care. The goal being to decrease maternal and infant mortality. During our mission to Uganda, we visited Tindarwesire, a 73 year old TBA in her village of Bufundi to get her side of the story. We entered her dirt floor hut followed by children of all ages, many of whom she had delivered. She told us she was self-taught and women came to her because she took good care of them. 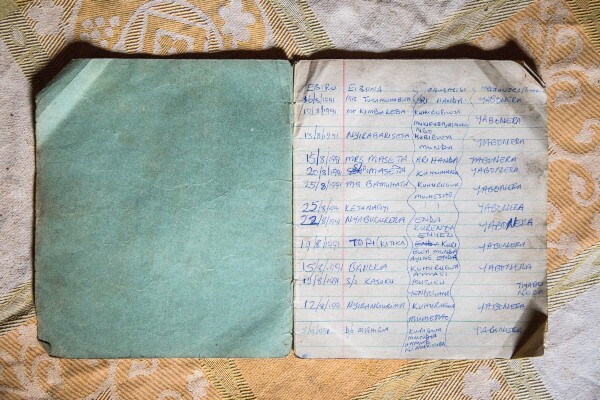 She showed us the meticulous records she kept on each birth dating back to 1991, listing the mother’s name, her village and the date of birth. Each month she would report to the nearest health center to give them these important statistics. Tindarwesire said that the government of Uganda was supportive of the services of traditional birth attendants and provided them with needed supplies such as gloves and plastic sheets until the AIDS epidemic. In 2009, the Ugandan Ministry of Health forbade traditional birth attendants from practicing and prevented NGOs from offering them training. The government stated that “they had deviated from their major role of identifying and referring pregnant mothers to health centres.” In other words, the traditional birth attendants were still providing unlicensed medical care. With this ban, the TBA’s no longer receive supplies from the government, putting them at great risk during the AIDS epidemic. Since they were banned form delivering babies they no longer reported home/village births to the health centers. The ban has had little impact. The TBAs are still practicing and women are still going to them for care. Tindarwesire stated that while she encourages women to go to the health center to deliver, she cannot refuse care to women who come to her for help. She stated that most of the women she sees lack any means of transportation and sometimes they are in active labor and are too far along to make the walk to the health center. She recently diagnosed a breech presentation and encouraged to woman to walk to the health center before she went into labor. I believe that the TBAs in Uganda will keep practicing as long as women need their services. We can say every woman deserves access to skilled medical care but until this becomes a reality TBAs provide an essential service.